Marc Kean now joins me on a regular basis with the podcast to share his knowledge and experience on Azure and PowerShell. Marc also lined up our guest for this episode, Reid Purvis, Microsoft Cloud Infrastructure Technical Specialist based in Sydney. Reid explains what Azure Express Route is all about and why it makes sense for even the smallest organisation these days. If you want to learn about Azure Express Route then this is episode for you. In this episode I’m joined by returning guest James Eling from Extreme Networks to talk about leadership, especially business leadership. James shares both his extensive knowledge and experience of being a leader both personally and in business. You’ll get some great insights here about what skills it takes to lead people and organisations through the process of improvement. As always, a big thank you to Marc Kean for producing this episode and doing the intro and outros. Here’s another recent personal episode that once again proves my point that we are headed to a very bad place with technology due to a lack of focus and understanding of the real value of security. While visiting a family member they informed me they feared their PC had been hacked. The reason sighted was they saw a message appear on the screen, while browsing the Internet, that told them their system had been hacked. They immediately panicked and turned the whole system off awaiting my arrival. Rather the visting the site I ran my own search on the name of the business. Above is the first result that was returned. If you look closely you’ll see that results returned are just ‘default text’ ( i.e. Donec ullamcorper…). This indicates to me that site still has some ‘defaults’ set somewhere. If that is the case then the site also probably has ‘default’ security, which really means no security! After a little more digging I turned up the suspect HTML page and the above image from the browser cache which is what the user remembered seeing. The suspect HTML also revealed that the exploit used was against an outdated Mailchimp WordPress plugin. After some further checking I was confident that the exploit targeted the insecure server not client browsers. I re-assured the user that all was good and they didn’t have anything to worry about (for the reasons I’ll point out a bit later). After some more digging it turns out that the company whose web site it was actually went into liquidation a while back. That was about 10 months ago as of today. 1. Why the hell is an insecure web site still allowed be to be running when that company was liquidated 10 months ago? 2. Who the hell is paying for that server to be still running? 3. If that web server was actually shared amongst others that insecure account now potentially makes all accounts on that server vulnerable. I could go on but …. My point here is that as we race towards making technology more and more part of our lives and our businesses, including connecting them all together all the time, we make ourselves more vulnerable to any single insecurity. The Internet of Things sure sounds great but it will open a Pandora’s box of pain for everyone by connecting every device we see to the Internet. Why? Because all it requires is one insecurity in any of these connected system to give the bad guys a foot hold. In fact, I would contend that it is too late, they already well entrenched. I’m scared. I really am. We are building a world that is going to fail, and fail potentially castastrophically. It is going to make us more vulnerable. It’s a world were the financial incentive is heavily stacked towards doing evil rather than good. It is pretty much impossible these days to go totally unibomber and unplug. Thus, our only realistic option is to deal with the world we have created. That means taking total ownership of your own security. Case in point, the family member who experience this issue was running a FULLY patched AUTOMATICALLY updating version of Windows 10 with other security measure in place thanks to your truly. Many people complain about the change Microsoft made to have Windows and Office automatically update. I, however, think that is GREAT! It is one thing EVERY piece of software MUST do in my opinion. Otherwise, we leave holes that the bad guys can crawl into and never be removed once they are in. The reality, which I believe fails to be grasped, is that technology security is a losing equation. Every day more and more software and devices become vulnerable because they are not being updated YET they remain connected, just like the web server my relative was visiting. I’m sorry, we are all doomed and technology is to blame. You have been warned. I have blogged and done plenty of presentations about different Azure services (i.e. Azure SMB File Shares recently), but when I looked through my list of YouTube videos I didn’t have a basic video that provided just an general overview of what Azure is. It runs for about ten minutes and hopefully provides a good resource for those who are still trying to understand what Azure is all about. which has about 19 lessons that are aimed at giving you basic information about some of the most relevant features of Azure for IT Professionals. which you can use now or any time in the future as I aim to continue to tag each article which deals with Azure. If you are still struggling with Azure, don’t hesitate to contact me with your questions and I’ll do my best to help shed some light on what at times, I understand, can be somewhat confusing. If you’d also like to see me write or present about something in Azure just let me know and I’d be happy to make it happen. All you gotta do is ask. A while back I wrote a post about how to turn off Delve. Can I turn off Delve? However, upon revisiting my tenant now I find the options somewhat different. The first step is to select your user icon in the top right of the Office 365 portal. That will display the menu shown above from which you select About me. This will take you to your Delve profile as shown above. If you now select the COG in the cupper right you should see the menu shown. From this, select Features settings. This displays the above information with the option to turn off documents in Delve. This is somewhat different to what it used to be as shown above which gives you the option to Turn off Delve and hide my activity from others. appears to navigate to a non existant page. Some of this confusion maybe because I have my tenant set to First Release which means I get newer features faster but I feel that things are not quite as clear as before when it comes to disabling Delve if needed. Previously, it spoke about not sharing your “activity” whereas now it only speaks about preventing your docuements howing up in other people’s Delve. Now your “activity” could now just be documents in Delve. That is, they are one in the same, but for the paranoid amongst us this lack of clarity could be a privacy concern. I think using “Don’t share my activity” is a much clearer and potentially wide ranging option. I can’t really see any benefits to users disabling Delve but there are a small minority who might and I think that somewhat clearer messaging around disabling Delve would prevent confusion in regards to privacy concerns. 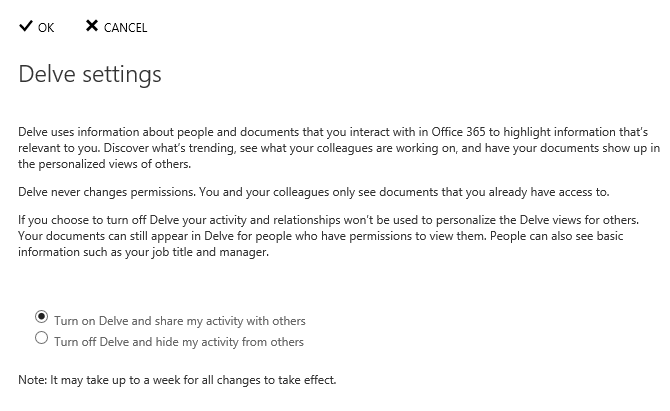 I however have no doubt that these setting will appear as the service conftinues to improve over time, however for the time being you only seem to be able to disable document sharing in Delve is as I have outlined above. This involves a different process to setup and so here is the walk through process of setting Azure Backup Server for Applications. You’ll need to have an Azure Backup Vault already in place as the destination for your backups. You create this Azure Backup Vault in the Azure management console under the Recovery Services option. You can have as many Azure Backup Vaults as you wish and my personal practice is to have a separate vault for each machine. If you need to create a new vault I have detailed how to do this previously. Once the vault has been created you’ll need to download the Azure Backup software. You can find this in the details for the Backup Vault as shown above. You need to download the Microsoft Azure Backup for Applications. Which will allow you to download the software. Beware that the Backup for Applications software is about 3.2 GB in size. Why? Because it includes the Microsoft Data Protection Manager (DPM) and SQL 2014. There are number of different files you need to download, as shown above. Place them all the same directory and then run MicrosoftAzureBackupInstaller. The installation process will now commence. Select Next to continue. The next step in the process is to expand the downloaded files into a single installation directory. You can customise this directory if desired. Select Next to continue. The files will now commence extracting into the directory that you nominated. Be patient, the extraction process will take a few minutes. When the extraction process is complete you are given the option to Execute setup.exe to install the software. Leave this option selected and press Finish. The setup splash screen should now appear as shown above. From this screen select Microsoft Azure Backup under the Install column on the left. The C++ Runtime will now be installed. The setup screen should now appear as shown above. Select Next to continue. Select the Check button in the top right to ensure all the prerequisite software is installed. If the prerequisites are met you should see a message confirming that as shown above. Select Next to continue. You’ll now need to specify an SQL server as part of the configuration. You can configure an existing SQL server on your network or you can elect to install a new instance on the current machine. If you select an existing SQL Server it will need to be running SQL 2014. In most cases you’ll want to install a new instance of SQL 2014, so ensure that option is selected. Now select the Check and Install button in the top right. Your system will then be checked. This should only take a minute or two. In this case the installation is on a member server and no critical issues were detected. Select Next to continue. You’ll then be prompted to confirm your installation configuration. Once you have made any modifications here select Next. Now provide a password for the two accounts required to run services. Remember to record this password! Select Next once you have entered a suitable password. Select how you wish to manage updates and then Next to continue. The configuration information is displayed. Select Install. The selected software components will now be installed. You’ll now be prompted to complete the Azure Recovery Services Agent Setup Wizard as you would with the normal Azure Backup option. Enter any proxy details and select Next. If additional software is required to support this agent it will be displayed. Supporting software will then be installed. When the required supporting software has been installed select Next. You’ll then be prompted for the location of the Vault credential file. You download this file from the console of the Backup Vault as shown above by selecting the Download vault credentials link. Once the vault credential file has been verified select Next. You’ll now need to generate a unique encryption key for this backup. In most cases you will select the button Generate Passphrase to create a secure key. You will also be prompted for a location to save a text file of this encryption key. Ensure that this key is recorded and a copy of the file is saved to another system so it can be used if recovery is required. When all this is complete, select Next. You will receive a confirmation message as shown above that the process is complete. Press the Close to complete the installation. You should now find an icon on your desktop like that shown above for Microsoft Azure Backup Server. Double click this to launch. The Microsoft Azure Backup console should now launch as shown above. I’ll look at covering how to use Azure Backup Server to backup and restore files in an upcoming post. Had a bit of a heart stopper with my Surface 3 Pro refusing to boot past the initial screen shown above. Phew! So if you didn’t know there is a two button process to ensure the Surface Pro 3 is off completely! Hoppefully, this get someone out of a similar jam and prevents them from trying lots and lots of things before discovering this process.